20th July 1837 saw the opening of the pioneer London to Birmingham railway, heralding a new age. Watford was transformed from small country market town to a London Satellite. This line was 112.5 miles long, which at that time was the longest continuous stretch of railway to be found anywhere in the world. Watford ‘s first station was not on the site of the present one. The most direct route would have been through the grounds of Cassiobury and the Grove. This was not popular with the Earls of Essex and Clarendon so the line swept in a quarter circle around the town and the station was built immediately to the north of St Albans Road. The small brick building close to the railway bridge is all that survives. The construction of a mile long tunnel was therefore necessary, costing the lives of 10 men while digging through treacherous chalk. Many more were injured. The early railway system was often dangerous. Almost immediately after the railway came to Watford, accidents and legal cases seeking compensation for injury appear on a regular basis. These accidents include decapitation and people being run down on the lines. Delays too were not uncommon. In 1858 a new station was built further down the line on the same site as the present Watford Junction; extended in 1875 and again in 1909. 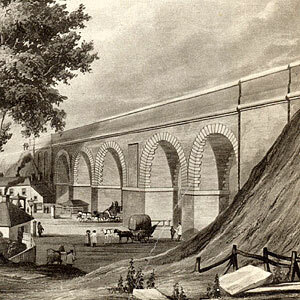 Because more people wanted to travel by train and more freight was being sent by rail, a fourth main line was laid and a second tunnel cut alongside the original one to the north of Watford. This is the Watford Junction that most people will remember. A third track was added in 1859 and a fourth in 1875. By 1913, Watford’s High Street Station became part of the LNWR branch line which also went to Croxley Green. The Bakerloo service to Watford began in April 1916, this was the furthest tube trains had travelled at this time. In 1922 the LNWR ran the first electric services from Euston and Broad Street to Watford, Croxley and Rickmansworth. In 1984, the Watford Junction building was demolished to make way for a remodelled travel centre and office block above. The 19th century waiting rooms which had so far survived, were all but one demolished in 1987.